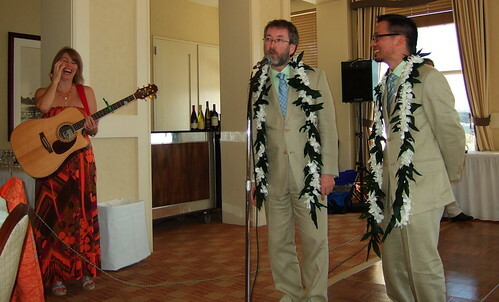 Three musicians played and sang live during our ceremony. 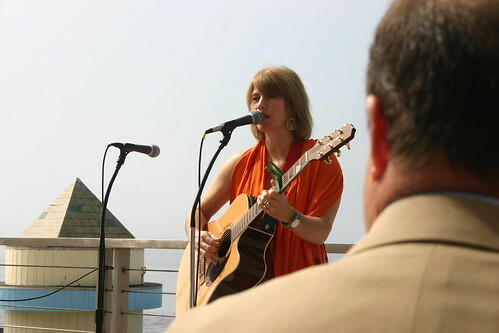 Singer-songwriter Sara Hickman, who earlier this year was named 2010 Texas State Musician of the Year, accompanied herself on guitar for our processional and recessional, singing and playing “Faithful Heart” and “I’m Not Going Anywhere” respectively. When we first began dating, we seemed to hear the Turtles’s song “Happy Together” everywhere we went, especially at a local diner where we frequently ate, and we came to think of it as “our” song. After we exchanged our vows, Alan, Jeff’s friend since high school, and Alan’s wife, Julie, sang “Happy Together” while Alan also played ukelele. For our first dance at the reception, Sara played and sang “Simply,” and followed it with a set of several other songs. As noted above, Sara played and sang a live version of this song for our first dance at the reception. 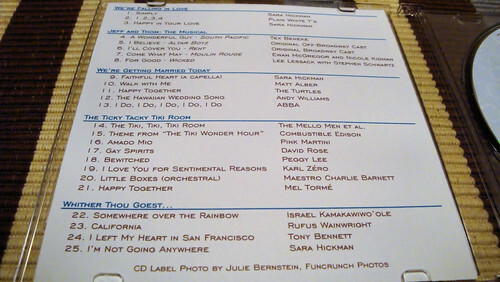 Sara also sang and played this live at the reception. We’re avid musical theater fans and regular attendees of shows — when we lived on the East Coast, we’d see around 12 Broadway and off-Broadway shows a year in Manhattan. The most recent musical we saw, less than a week before the wedding, was the national tour production of South Pacific, here in San Francisco. This is a love song between two of the show’s male characters. We’ve seen Wicked twice, once in New York and once in San Francisco — and are seeing it again next week with our mothers. In the show, “For Good” is sung by the two female leads, but we particularly love this male duo cabaret version that features the show’s composer and lyricist, Stephen Schwartz. Sara sang and played this song live as our ceremony processional. Matt is an openly gay musician and a former member of one of our favorite men’s choruses, Chanticleer, who has now started a solo career. This song wasn’t performed during the ceremony, but was on the reception playlist. “Our” song. This is the original and best-known version. 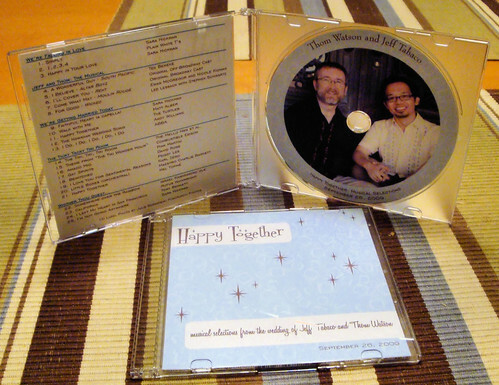 We included this in our playlist because of our celebration’s tropical theme, during which we presented leis to each other in the Hawaiian tradition. Tiki was another theme for our reception, and our tables were named for the gods of Disney’s Enchanted Tiki Room. This song features the Enchanted Tiki Room song and the voices of the four Tiki Room parrots. Pink Martini is one of our favorite musical groups — we’ve seen them live at least three times — and we love their mix of lounge, big band and world music. The design of our menus and place cards were influenced by the Bewitched television show’s opening credits. We love this sultry Peggy Lee cover of the show’s theme. A loungy love song from the wonderfully campy and fun album, Songs for Cabriolets and Otros Tipos de Vehiculos. “Little Boxes” was written by Malvina Reynolds allegedly after seeing the rows of houses in Daly City, where we make our home, and is the title of our friend Rob Keil’s book about Westlake, the mid-century suburb in which we live. A gorgeous smooth version of “Rainbow,” the gay favorite from The Wizard of Oz, and performed on a ukelele! Of course it’s on the disc. Jeff is a huge, longtime fan of Rufus Wainwright, and is largely responsible for Thom having become a great fan as well. What loungy, retro-inspired wedding in San Francisco would be complete without this standard? Sara sang and played this song live as our recessional. If you’re interested, the full reception playlists are detailed below. “I Could Write a Book” – Harry Connick, Jr. 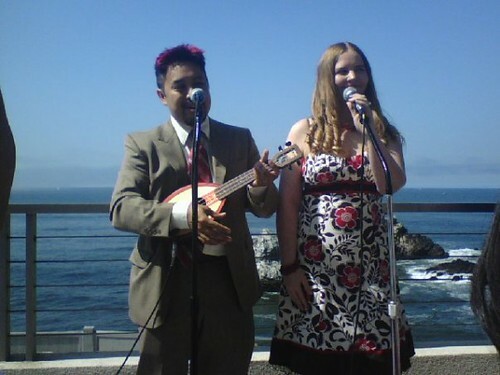 This entry was posted on Friday, October 2, 2009 at 12:33 pm and is filed under Music, Wedding. You can leave a comment and follow any responses to this entry through the RSS 2.0 feed. I love the Martini Kings! 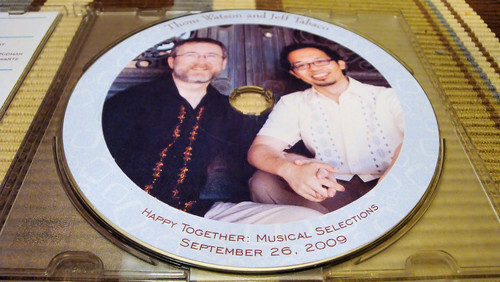 Unfortunately (well, I guess it’s not all that unfortunate, since it’s better to have too much of a good thing than not enough), I had way more music I would have liked to have used than we had time for on either the CD or through the reception, so I had to cut a lot from my original playlists.